REDUCED ! Pack your bags and move in ! REDUCED ! Lots of light! Playacar Phase 2, Playacar – This 2 storey three bedroom home for sale in Playacar Phase 2 is a short 10 minute walk to 5th Avenue, close to services and Playacar Best Beaches. Inside the gated golf community of Playacar, in a secure neighborhood is accessible and has wide streets, great for riding your bike. Living room opens up to patio with great common pool area. Rooms are spacious with private bathrooms. Master room has jacuzzi and large terrace with pool views. A perfect and charming home for living or renting. Playa del Carmen is a great beach town community filled with charm and has great shopping, dining & night life. Very close to Cozumel ferry. Beaches and water sports abound! Call us today for this great 3 bedroom home at an amazing price. 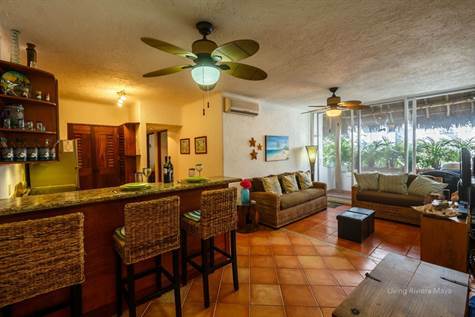 Little Italy, Playa del Carmen – Turnkey condo for sale in Playa del Carmen. Perfectly located, being close to 5th avenue for fine dining, nightlife and shopping. A perfect place for people-watching. Completely updated and upgraded interior including all new bathrooms, new kitchen cabinets with granite countertops, new stainless steel appliances, new windows with big screens, new sliding glass door to balcony. New rooftop terrace with built-in BBQ, tiled counter with sink, tiled feature wall and new exterior lighting. A great place to entertain family and friends ! Enjoy your private + spacious terrace year round, in the best tropical climate. Most furniture and accessories included. (Seller will remove some furniture and artwork and personal items). This is a superb 2 bedroom condo ! Great price, great location, own and live in paradise. 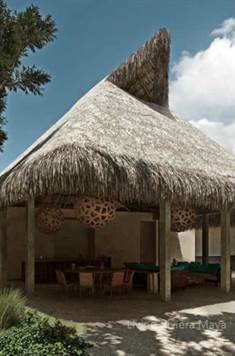 holistika, Tulum – A great new area being developed in Tulum. Inside Holistika, lined with large streets ans lush vegetation, find your quiet oasis inside Tulum Village, the Caribbean’s fastest growing city. Use of local materials, such as a very resistant local paste called Chucum used for the walls, local carved stone in the garden and parking areas, and local hardwood, lasting materials making your property age gracefully within it’s tropical climate. Several common areas: 2 solariums ( Rooftops of Pich and Tauch buildings). Each one of these areas has one full bathroom and one Jacuzzi finished with Chucum in one terrace with wooden beams area and perimeter planters. Apartments are modern and unique, with unique trim. Come see these stylish condos for sale in Tulum. Tulum Real Estate is the place to invest, a hip and chic beach town, known for it’s local fresh fare, bohemian chic ambiance and paradisiacal beaches. 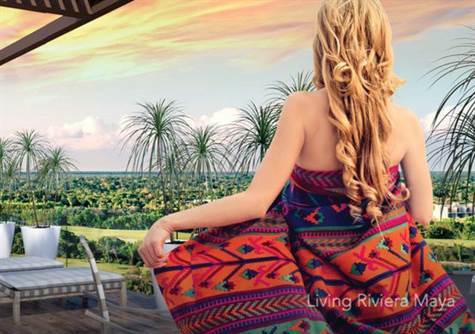 Aldea Zama, Tulum – New Aldea Zama complex, Tulum’s newest neighborhood, where you will want to invest AND live. An exclusive development combining majestic surroundings, perfect climate and lush vegetation. 3 bedroom Penthouse for sale ! 38 stylish apartments all with high-end luxury finishes, and respecting use of local materials. * many condos and penthouse have sold. Please ask us to see what is available. 2 and 3 bedroom Condos, apartments and penthouses for sale. Tulum is a great place to live, close to ruins beaches, and much more. Call our office to find out more about Tulum Real Estate opportunities and many of our other Riviera Maya properties. From homes, condos, apartments, commercial and hotel properties, we also are a turn key operation, helping you rent your property for great return on your investment ! Downtown, Playa del Carmen – Announcing a price drop on Avenida 15 Norte entre Calle 38 y 40, a 732 sq. ft., 1 bath, 1 bdrm single story. Now $155,000. Price reduction !! Bahia Principe, Tulum – The best resort living concept in the Riviera Maya. These gorgeous residences are within a beautifully manicures golf resort. A luxury residential development in the Riviera Maya and one of Grupo Piñero’s, a highly successful developer, real estate developments. 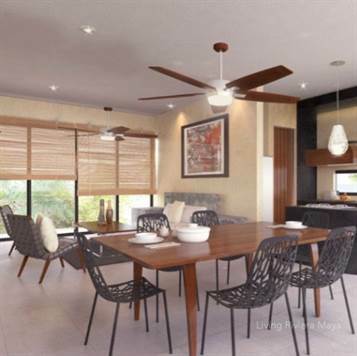 One of the most exclusive real estate developments in Riviera Maya, Mexico. The development is spread over an area of almost 300 hectares. Easily accessible with 24-hour security, magnificent roads and lush landscape gardening. It is surrounded by the Riviera Maya Golf Club, a spectacular 18-hole par 72 and 9-hole par 27 golf course. Lakes, deep pools and an indigenous forest are all features of this course designed by Robert Trent Jones II. The entire development is protected by internal building regulations and is based on a concept of contemporary architecture, with simple lines, light colours and hardwood, in perfect harmony with the surrounding areas. The complex is one of the most in-demand real estate developments in the area, where different products of the highest quality are offered. Looking to invest in real estate in the Riviera Maya? The Bahia Principe Riviera Maya Residences & Golf Resort are part of one of the most exclusive luxury property developments in the Mexican Caribbean. These gorgeous condos for sale are inside a residential development that provides the services and amenities needed to live and enjoy NATURE, GOLF, THE BEACH and a FIVE STAR HOTEL. Located facing hole 7 of the magnificent Golf Course, these condos for sale offer 1 and 2 bedroom apartments as well as lofts and Penthouses. The complex holds 60 condos and penthouses laid out in four buildings each one having four levels, with modern design. The condos on the third level have a beautiful sun roof with the best views over the golf course. 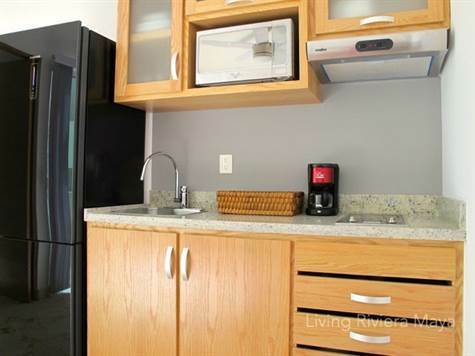 Theses condos offer the most comfortable experience to live and enjoy the Mexican Caribbean. Each flat is unique ! Every human being is different from the other, pursuing that philosophy, ALL apartment configurations are different from each other, making every flat “A UNIQUE PROPERTY” from the rest. THREE BEDROOM, W/ROOF GARDEN & PLUNGE POOL. TWO LEVEL – TWO BEDROOM LOFT + STUDIO WITH GARDEN. – Equipped kitchen with black granite countertops. – Wood finish closets and cabinets. – 4 inch white color aluminum frame, 4+4 mm laminated glass, and tempered glass rails. – Marble & ceramic tiles on floors and bathrooms. – Mini split type air conditioning. – Roof garden with integrated plunge pool. * Optional furniture packages available. Bahía’s Beach Club unlimited access. * Bahía’s resident preferred green fee rate. Great rental program DREAMS DO COME TRUE ! You can choose from a great variety of Financial plans for your dream to come true, from 10% down payment and up to 8 years of private financing. Also you can save money in of your condominium purchase value by putting it on our Bahia Exclusive Property Rental Program. While you and your family are not staying at your condominium, let us put your property to work and receive monthly rentals which you can use either to pay the rest of the property or make some profit out of it. Ask your sales representative about our exclusive Financing plans & Property Rental Program and start living the dream! • 6,037 sq. ft., 6 bath, 6 bdrm 2 story “with ocean and canal views” – $1,150,000. +Boat+Car+Golf Cart incl. Marina, Puerto Aventuras – This Amazing Puerto Aventuras home for sale is located on a quiet canal with a 15 meter boat dock and is located in a gated community with security that provides round the clock surveillance. You may swim in the pool, hop on your boat from your 48 foot dock, or take a five minute walk to the beach. The home’s attractive features include: a unique design with a dramatic spiral staircase to the second floor and up to the rooftop, a huge master suite, a second master suite, 6 and one half baths, many skylights throughout the house to offer natural lighting, and rooftop deck with views of the Caribbean sea. The property also has a private pool with a dramatic waterfall, a large backyard garden, and a small caleta to launch your kayak. A spacious entry way leading to the living room and dining room with sliding glass doors where you step out onto a spacious patio featuring a decorative rock wall accent feature. The soft water pool awaits you with a soothing fountain overlooking the large backyard, the boat ramp, a separate palapa for entertaining and a 48 foot boat dock. There is wood work throughout the home with solid core doors and brass hardware. The kitchen has new stainless steel appliances with natural stone counter tops. There is a separate laundry room with new washer and dryer and an adjoining pantry offering loads of storage space. There is also space with an independent front entrance to provide caretaker quarters (living/bedroom area, closet and full bath), a bedroom, or workout room. There is a powder room on the first floor off the living room and access to the to the attached 3 car drive-thru garage. At the top of the landing there is beautiful entertainment area, 2.5 double closets offering tons of storage space. The master bedroom’s distinctive characteristics include a huge bathroom with separate bathtub and shower, toilet and bidet, plus a serene gardens area under a skylight as well as a skylight over the shower area which provides tranquil natural lighting. There is a custom walk-in closet with built-in storage and drawers of mahogany wood. There are steps to the bedroom area including a separate seating area with sliding glass doors to a darling balcony that overlooks the canal and the lush backyard. The second bedroom is a 2nd master suite complete with dramatic cathedral ceiling, steps up to a seating area where large windows overlook the view of the pool and the canal. This bedroom is accompanied by a large bathroom with a bath tub and separate shower. Off of the master bedroom and second master suite is a sunroom/solarium with large windows framing a glorious view of the backyard, the pool, and the reflecting waters of the canal. There are two more bedrooms on this level with classic features, vaulted ceilings and plenty of storage with built-in wooden closets and drawers plus individual bathrooms. Additionally there is another large room with many windows to be used as an office or a guest bedroom/playroom. Finally the spiral staircase leads you to the rooftop which features striking views of the ocean, including a serene palapa covered bar area, a sun deck and a Jacuzzi tub for 4. The property has a 3 car drive-through garage that provides access directly from the road to the boat ramp to launch your boat. 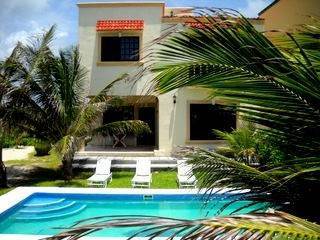 A rare gem in Puerto Aventuras Real Estate for sale, call us for a private viewing!